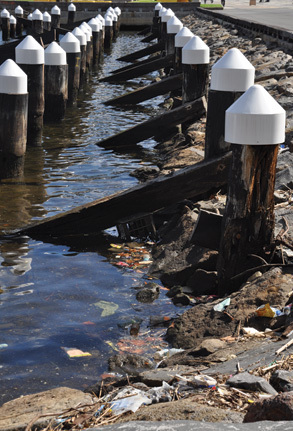 A report released last month has called on the State Government to introduce a new governance structure to protect the Yarra River. The Let’s Act for the Yarra report released by Yarra Riverkeepers and Environmental Justice Australia last month calls on the State Government to enact the Yarra River Protection Act it promised pre-election. The report seeks a new governance model for the whole of the Yarra River, differing from the approach of stakeholders in Docklands, who continue to advocate for a single port authority to govern local waterways. Before last year’s election the Labor Party promised to introduce a Yarra River Protection Act to protect the river corridor from inappropriate development. It has also promised to establish a trust that would develop standardised planning controls for the Yarra and work with agencies to promote the river’s amenity. According to the Let’s Act for the Yarra report, the biggest challenges currently facing the Yarra River are overdevelopment, environmental stress and poor water quality. In addition, the report outlines how the number of municipalities and agencies with jurisdiction over parts over the river, alongside a complex mix of laws and regulations, make it harder to address the river’s problems. The report advocates for the introduction of a Yarra River Protection Act and independent trust in order to “cut through the complexity of the current regulatory situation, making it easy to ensure good decisions are made to protect the river”. “We congratulate the Government for committing to enact a Yarra River Protection Act with its own independent body to better manage the river from source to mouth,” Yarra riverkeeper Andrew Kelly said. “The Yarra is at the crossroads right now and we need to take advantage of the opportunity to enact a Yarra River Protection Act if we’re going to ensure a truly world class river for the world’s most liveable city,” Mr Kelly said. The right for the community to step in to have good environmental rules enforced and pathways to improved environmental outcomes considered. Director of advocacy and research at Environmental Justice Australia, Nicola Rivers, says the Government needed to start working on the legislation. “The Yarra is such an important, iconic river, its deserving of its own legislation and it needs its own independent agency to be a champion for the river,” Ms Rivers said.